Want to expand your business’s reach on social media? Have you thought about involving all of your employees? Your company’s social media reach can grow dramatically if all of your employees are helping to spread your message. In this article, you’ll discover how to involve your entire staff in your social media marketing. 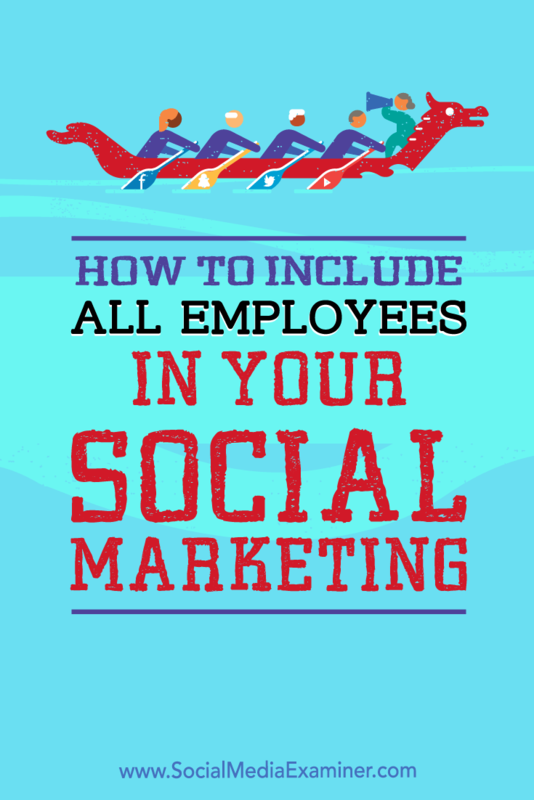 How to Include All Employees in Your Social Media Marketing by Ann Smarty on Social Media Examiner. Social media marketing is getting tricky these days. There are so many businesses competing for attention and customers are more willing to talk to people than brands. So how can you get your business’s message heard on social media? By getting your whole company talking about your business on social media. But including everyone in your social efforts is more complicated than just telling your employees to share your links on their profiles. You need to coordinate your efforts so everyone understands the core social strategy and how they should be representing the brand. Here are some tips for getting everyone onboard the social marketing train. It’s essential that every player understands what’s happening where and when. Obviously, you can’t keep everyone on the same page if they’re using different tools. Choose one tool, put everyone on it, and communicate. 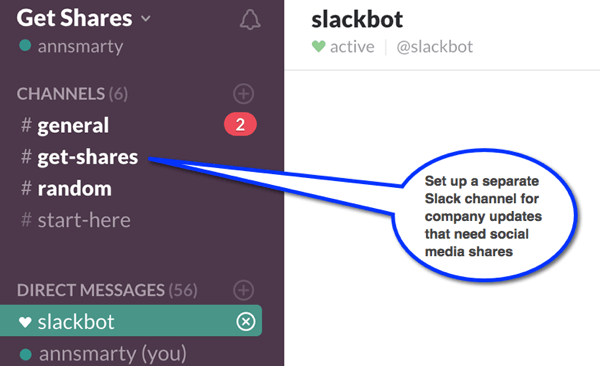 Slack is my personal favorite, because you can create channels with certain permissions that allow you to speak to different groups, while keeping everyone involved with the process. Plus, it’s easy to use and has a mobile app so you won’t miss anything. Slack lets you create channels so you can organize conversations for different groups of employees. DrumUp is another tool that will keep everyone in the loop. 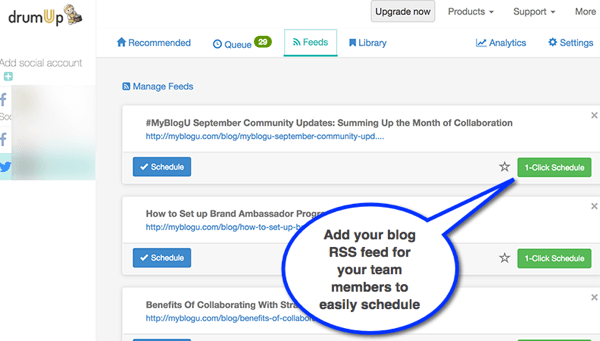 Their employee advocacy feature allows you to import the RSS feed of your company blog so your team members can easily share and schedule shares across their own social media channels such as Twitter, Facebook, and LinkedIn. DrumUp lets you import your company blog’s RSS feed and makes it easy for employees to share content. Employees outside of your social team might have good ideas about your campaigns and future tactics for dominating different networks. They also might have some terrible ideas about it. Either way, you won’t know unless you give them a chance to tell you, and they aren’t likely to share their ideas without being asked. Every few weeks, schedule a meeting where people can share their ideas and everyone can discuss them. In the meantime, create a place where people can make suggestions between meetings. I’ve always used Trello for this, since anyone can add a card. It also keeps the information organized because people can tag the topics of their feedback. 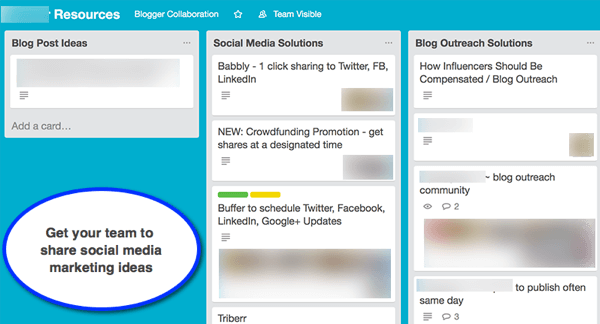 Set up a Trello board for employees to make suggestions for your social campaigns. Chances are, your employees have at least some connection to your target demographic and what’s hot in the online world right now. So giving them opportunities to present their ideas will help you keep your finger on the pulse and take advantage of current trends, hot topics, and even memes. BestAndroidApps.com lists more collaboration tools to choose from. Another way to encourage your employees to share your company updates is to feature their social shares on your blog. Add your employees to a separate Twitter list. Introduce a unique hashtag and encourage employees to use it whenever they tweet something related to the company. Use a Twitter widget to embed the updates to your blog. For Instagram, try a tool like Yotpo, which has a powerful Instagram curation feature. Again, have your employees use a unique hashtag, and then from the Yotpo dashboard, pick the coolest updates and publish them to the Yotpo widget you’ve installed on your page. 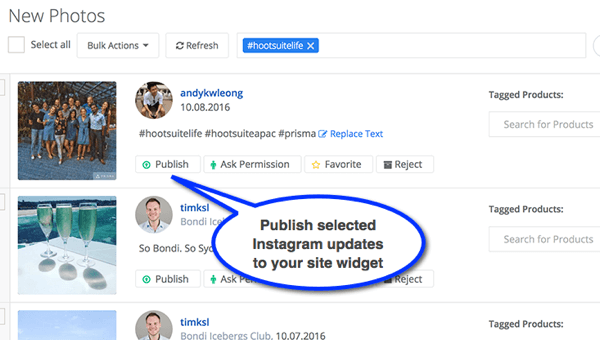 In your Yotpo dashboard, pick interesting employee updates and publish them to your Instagram account. You can also use Yotpo’s curation feature for in-company contests to encourage and reward the most creative Instagram updates relating to your company. Employee satisfaction is likely to rise when you applaud employees on your company’s social media channels. Your engagement is sure to increase as well, because your employees will like, comment, and reshare the updates that feature them. This tactic both benefits your company and encourages employees to become your brand’s social media advocates. Publish lots of pictures from events, lunch gatherings, and office routines, and take the time to tag employees in those updates so they’ll be notified that they’re featured. 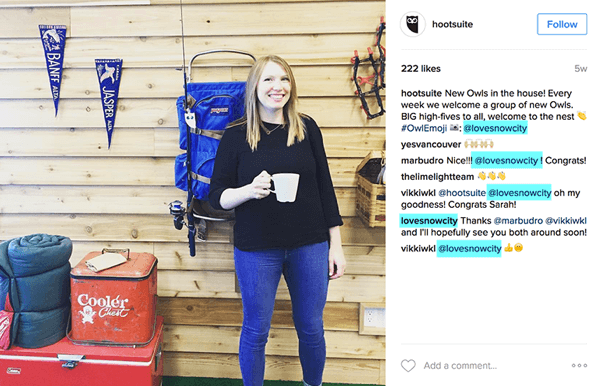 As an example, Hootsuite features their employees frequently on their Instagram account. They never fail to tag the employee in the description, which usually results in more engagement. Spotlight employees in your social media updates and tag them for further engagement. Make sure you share all of the positive results with your team members to include them in your success. Leadfeeder makes it easier to monitor leads coming from social media so you can see the tangible outcome of your team’s effort. Just set up a few filters to monitor leads who have discovered your site from social media (Twitter, Facebook, LinkedIn). 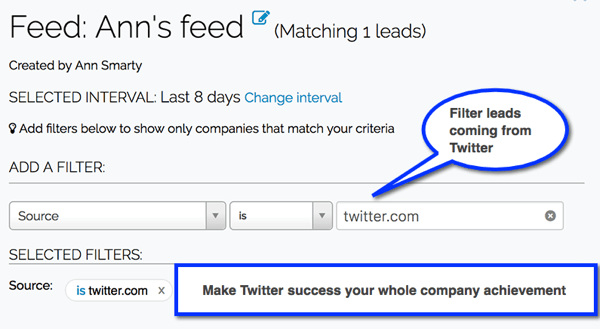 Create Leadfeeder filters to track leads coming from your social media channels. Create a new notification so your team knows about new leads coming from Twitter. In Leadfeeder, set up email notifications for new leads coming from Twitter. A Business 2 Community survey found that 90% of people between the ages of 18 and 29 use social media, and a third of those prefer social media as their primary form of communication with brands. Moreover, the brand message is reshared 24x more frequently when distributed by employees versus brands. More companies are starting to realize that benefit and are allowing their employees access to social media. As far back as 2012, Gartner reported the number of companies blocking social media access for employees was dropping at 10% per year. Fifty percent blocked access in 2010, and less than 30% blocked in 2014. While your employees will almost certainly be happy to help on the social media front, it’s not their primary job. If you expect them to do it for nothing, you’re just adding extra work to their already busy schedules, which is a quick way to lose your team. If you want to include them on social media for your business, you need to give them incentives for sharing content, interacting, and taking part. Think of it as an in-house ambassador program. Give them swag, extra cash, discounts, free services, or anything else you can think of that will encourage them to make social sharing a part of their daily tasks. You should also make it a fun process, such as taking photos or videos of team get-togethers and parties. Believe it or not, even that small gesture can up their game because they feel appreciated. If you incentivize social media use, you’ll see results. What do you think? 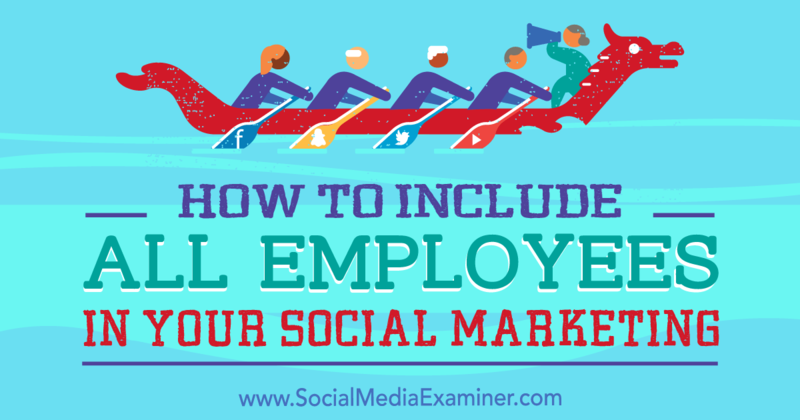 Will you consider including your employees in your social media marketing? Do you have any tips to share? Let us know in the comments!